Ever since its first appearance in Raiders of the Lost Ark, the Raiders March has been such a recognizable symbol of Indiana Jones that we associate it with the character as much as we do his trademark bullwhip and fedora. And like other John Williams themes, it’s not just that the theme represents the character, but that it does so in such an appropriate way that it would be hard to imagine something different working this well. In large part, this is because of Williams’ remarkable ability to coordinate many different parameters of the music with various facets of the thing it represents, in this case, Indy himself. The march is divided into a large three-part form, of which the first part is Indy’s theme, the second Marion’s theme, and the third an abbreviated return to Indy’s theme. Since we’re talking about Williams’ depiction of the Indy character here (and since the third part largely repeats the first), my film music analysis will focus mainly on the first part. These syncopations add a buoyancy and lightness to the march, and signal some of Indy’s less serious, “fun” side. Overall, the highest notes in these motives form a rising contour from C up to F. But also notice that in between each of these high notes, there is a drop down to a lower note. Naturally, the rising contour gives us the feeling of aspiring to something better in the manner of a hero. But the drops in between lower the tension and create a more relaxed heroic sound than would a constant striving higher and higher, as in the Force Theme, for instance (see Part 1 of this series). And certainly this accords with Indy’s confident brand of heroism in that he’s never really fazed by anything (well, anything but snakes!). The smaller leap of Indy’s theme suggests a hero that is more human and “down to earth”. After all, Indy usually doesn’t overcome his enemies through some kind of superhuman strength or power, but with his ingenuity. (This is emphasized by the fact that he is a university professor by trade.) At the end of Raiders, for example, he shuts his eyes (and tells Marion to do the same) before the spirits from the Ark turn deadly. And in Indiana Jones and The Last Crusade, he reasons that since Jesus was a carpenter, his cup at the Last Supper (the Holy Grail) would have been one made of wood, not metal. In both cases, it is Indy’s knowledge that saves him from perishing like his Nazi foes. The march begins with four bars of accompaniment that repeat a single C major chord. This major chord not only gives the march a positive connotation from the get go, but because it is the tonic chord of that key, it has a very stable sound and its repetition gives us the impression we are “in good hands” with Indy. This stable sound continues when the familiar tune starts up, as the bass remains fixed to the C even when the chords overtop change, creating what is known as a pedal point in the bass. At least for these opening bars, it seems as if nothing can shake our hero. With the sixth bar of the melody, however, we hear a chord (bII, or the “Neapolitan”) that, for the first time, sounds notes outside of the C major key. This presents a challenge to the that key, and because the notes of the chord are “flat” compared to the major key, they have a slightly ominous quality to them. In short, the music seems to be questioning the hero at this point, presenting him with a potential danger that he must overcome. And overcome it, he certainly does! Not only does the music return to the brighter colors of C major, banishing the gloomy sounds of the flats, but it does so with such panache and style that we are certain of the success of our hero: the trumpets and trombones together sound a loud fanfare that marks the climax of the melody’s eight bars. Not only that, but for the first time in the theme, the motive now takes a downward turn, descending by step, as though Indy is literally overcoming some obstacle. And we hear this descending step four times in a row, leaving no doubt in our minds that Indy will succeed in his adventures. The melody here can’t seem to get any higher in the scale than the E (of course the melody leaps up to the E an octave higher, but this is still an E and isn’t any higher in the scale than the previous E). In fact, the melody moves even further downward as the melody continues, through Eb, D, and stopping on C.
The stable sound of the pedal point we heard at the march’s opening returns to start the B section with a repeated C in the bass. Nearly the entire B section is propped up by this pedal, which again speaks to Indy’s confidence even in the face of the struggles suggested by the rising-falling melody. At the same time, almost every chord used in this B section is a major chord (some with an added seventh). This injects a strong positive element into the sound of the struggle here despite the more ominous flats appearing in some of the chords (bVII and bVI). Like the march’s A section, the music seems to be saying that the struggles Indy will face won’t be anything he can’t overcome, even if they seem to challenge him at times. Again, we are in good hands here. The Raiders March isn’t just a great tune. Like so many Williams themes, it is an apt reflection of the character it represents. Not only does it capture Indy’s heroism and confidence, but it also incorporates the fun, lighter side of Indy’s personality. It is also fitting that Indy’s music should lack the overwhelming grandiosity of other superheroes’ themes since his victories are more brainy than brawny. His music also portrays him as more of a human, earthbound type of hero than, say, Luke Skywalker or Superman. Instead, this is an untroubled kind of music for an untroubled kind of hero, one who always achieves a clear success. Even so, his adventures and his music are still a source of tremendous excitement. This is a really wonderful article! As a student studying music the analysis you make of the piece not only makes me appreciate John Williams’ genius even more, but will undoubtedly help me to compose my own music better. Well done, a real treasure! Thanks, Adam! Glad you like the article. Another Williams post will be coming out in June on his Superman theme as a prelude to Zimmer’s Man of Steel score, which I hope to write about as well. Cheers. Concerning the Superman themes, I can’t wait to read your posts in June. Do you think that it is apropos for the new film to completely scrap the JW music and go with the newer modern sounds of Zimmer? I personally love JW’s music and find it hard to believe that Zimmer can write anything that musically comes close to JW’s Superman theme. Perhaps you can write a compare/contrast post concerning this superhero’s music. Hi Marcus – a pair of compare/contrast posts on Superman is exactly what I intend to do! The third trailer for Man of Steel has some music that I assume is part of Zimmer’s score, and it’s interesting because I actually hear a couple of nods to Williams’ theme. They’re subtle, but I think they’re there – something I’ll discuss in the posts. As to whether something different is apropos, I suppose I’m always open to new approaches. From the sounds of it, Zimmer’s score will be nothing like Williams’, and I think that’s a good thing. The film looks like it will be entirely different – less light-heartedness and more contemplative seriousness. The light-heartedness is something that Williams says was very important for him when he was writing the Superman theme, so to me, a film with more gravitas just wouldn’t work with Williams’ score. My thought is that Zimmer’s score will be appropriate in its own different way. One thing that Zimmer is very good at is finding the right emotional quality for the various scenes in the score. Williams of course does this incredibly well too. In short, I’m not expecting to be disappointed with the new score, even if it is miles away from Williams’ iconic theme. Thank you for the analysis. For us non-musically literate types it world be great if you could follow the notation shown above, at least roughly perhaps using midi, of the musical parts in question. Otherwise a great article and site. In case you’re looking for MIDI arrangements, look no further than rips from LucasArts’ DOS games from the late 80s to the mid-90s. 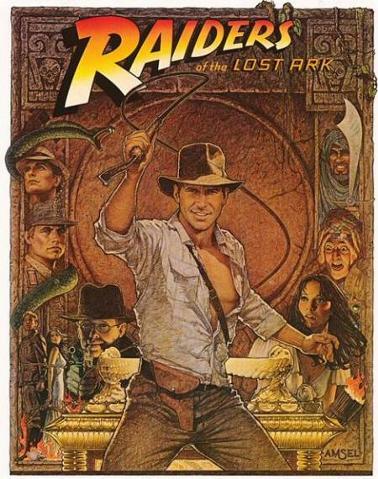 I think for the Raiders’ March, the best choice would be the MIDI file from “Indiana Jones and the Fate of Atlantis”. Clint Bajakian has always done a great job transcribing Williams’ music. This theme is absolutely the most perfect “I’m going on an adventure” theme ever written. When going on a vacation, try playing this. If you’re a parent, your kids will love it blasting in the car for a road trip!